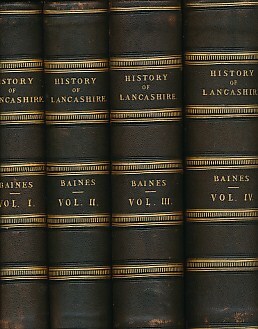 Barter Books : Baines, Edward : The History of the County Palatine and Duchy of Lancaster. 4 volumes. Numerous engravings including two hand coloured maps and fold out tables. 290 x 220 mm (11 x 9 inches) - 624pp; 680pp; 760pp; 876pp. G+ : in Good condition plus with marbled eps. Cover lightly rubbed. Some offsetting. Fold out plan of Manchester in volume II torn with some loss.